January has arrived and I’m excited. It might be the middle of winter, but New Year always makes me feel rejuvenated. December provides a festive distraction for the most part but I must admit I’m rather sick of it all come Boxing Day. Far too much eating and drinking means by the end of the year, I’m grumpy and slow. When the New Year breaks, I feel I can wipe the slate clean and start the plans for the season ahead. Many will be making (perhaps already breaking) their New Year resolutions. I prefer to have aspirations – it feels more a positive term to use. In between stuffing my face and sitting on my backside, I’ve started thinking about the plot and my aspirations for 2017. Planning things out has always been an important element in many aspects of my life. I like considered goals and having a structure in place to achieve them. 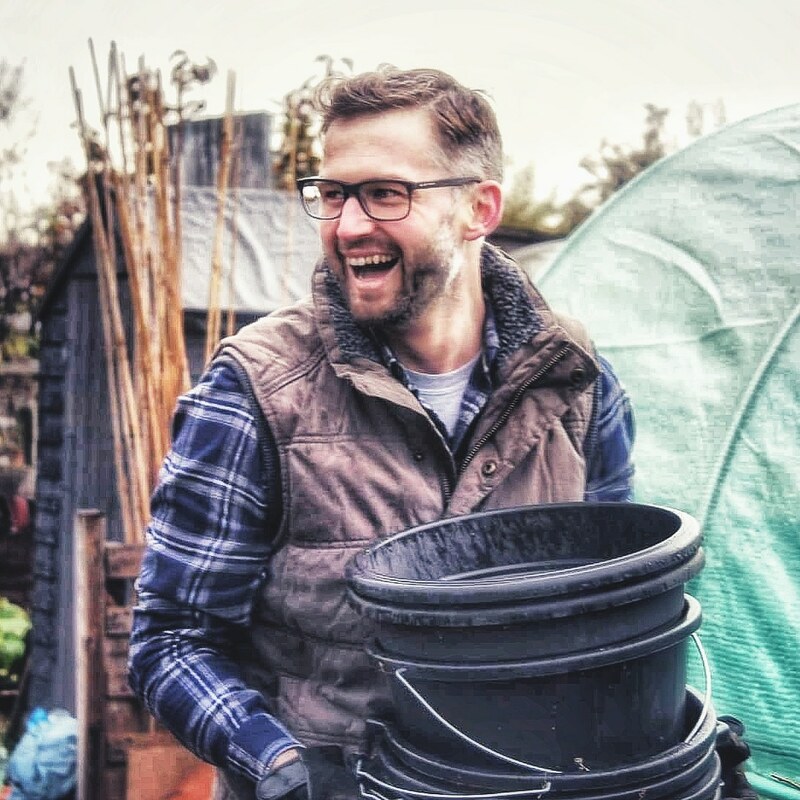 I do this for every visit I make to the allotment and I’ve found it enables me to remain focused and ensure I make progress and achieve something each time. I’m not the only one who likes to take the time to make considered plans in the garden. James Robbins is a gardener in a large private family garden in Hertfordshire called Dew Pond House. I love reading James’ blog posts as they are always beautifully written and inspirational. James wrote a New Year post that describes his own process for ensuring he continues to move closer to his goals. If you’d like some inspiration for practical planning and keeping yourself on track with your own gardening goals for 2017, I’d encourage you to read ‘Turning over a new leaf’ on James’ blog. When putting a plan together for the allotment garden, I think it’s important to reflect on the previous year first. I have long felt allotment gardening is a journey and by reflecting on the journey so far, it reminds you how far you have come and to celebrate the achievements. There will certainly be things that didn’t turn out so well. I prefer not to think of them as mistakes as such, rather as lessons that provide both knowledge and experience which enables us to make better decisions for the new season. This time last year, our plot was a very different place indeed. In the winter of 2015, I’d turned a corner in the development of our allotment garden, and after six months of ineffective, disorganised cultivation of the overgrown patch, I’d set out a plan of action and progress was only a spade turn away. Then came the rain and it continued through December and well into January of 2016. The allotment flooded and my plans were washed away. I came close to throwing in the towel. However, I took a step back and rewrote my plans. I spent some time to research the issue of waterlogging and the solutions. The erratic weather conditions we continue to face in the UK means waterlogged allotments have become a common sight. If you have similar problems, please don’t despair. It can be daunting to see your allotment looking like a pond but don’t give up. Waterlogging can be resolved if you put in the work. This winter, with the work I put in and so far having been spared the heavy rains suffered by most of the UK last year, I’m pleased the allotment is in a very good place as we start 2017. Attending the allotment in winter is a great opportunity to win time in readiness for the spring. In November last year, I noticed a decline of plot holders at the allotment and I genuinely felt it was a shame. It inspired me to write the blog post: Why winter is a winning time on the allotment. I’ve spent a few of the cold, crisp days on the plot during December to get ahead. I’ve prepared the established beds by clearing them of weeds, digging them over and I’ve incorporated plenty of manure. I’ve also made a start on creating new beds on the half of the allotment that I’ve yet to cultivate. Despite the grind of digging the new ground, I’m excited about the new growing space it will create. I have another thirty feet of ground to utilise on the allotment. That’s quite a few more beds to grow more fruit and veg. As an allotment gardener, I find I’m more excited by the sight of the new seed catalogues and garden magazines landing on the doormat than Christmas cards. Like many of you, I’m delving into them on the dark winter evenings, dreaming of what 2017 on the plot will bring. After suffering the cruel allure of having to look at the wonderful growth on the first year rhubarb plants, I’m very excited to harvest a few of the crimson stems this spring. I planted two crowns last spring and they have established themselves wonderfully. As well as crumble, I’m already making plans for rhubarb preserves and maybe even a tasty drop of rhubarb wine. Having planted back in the middle of October, the garlic is making good progress. The elephant garlic is also peeking through the soil. As you can never have enough, I planted some Solent Wight just after Christmas which I bought from The Garlic Farm. I was impressed by the service – delivery was super fast and the quality of the bulbs is excellent. I’m sure I’m not alone in the desperation to start sowing and growing. It does pay to be a little patient, though. This year, I’m planning on growing our onions from seed. I’m both nervous and excited by this prospect. I’ll be sowing the onions at the end of the month and I look forward to sharing the experience with you – as well as receiving your advice and tips! The preparation I’ve carried out and the new space I have available this year has made me spend some time thinking about the varieties of vegetables I’d like to grow on the allotment. One of the greatest things about having an allotment or kitchen garden is the opportunity it provides to grow the varieties of fruits and vegetables that are not readily available in the supermarkets. I always intended this blog to inspire others to join in and grow their own. There are so many benefits of having an allotment garden both physically and mentally. You will likely know that my six-year-old daughter Ava, is my little helper on our allotment. I had a wonderful time with her on the plot last year and I love how much enjoyment she gets from being there and joining in with the growing of the crops. I want her to understand where our food comes from and form a strong connection with how our crops grow and arrive on the dinner plate. This year I plan to cement that engagement and inspire her with the choice of fruits and vegetables we grow and eat. I’ve decided to pick interesting and colourful varieties of vegetables as I think she will be very excited to see them grow and this will follow through into her eating them. Sneaky! There are a few already taking my fancy. Rob Smith (Winner of the BBC Big Allotment Challenge) has an incredible range of heritage vegetables with seed supplier Dobies. I’m having a hard time stopping myself buying and trying to grow everything in the range as they look fantastic. I’ve decided to definitely give the Pea – Blauwschokker a try and the Cauliflower – di Sicilia violetto. The colour on both are incredible and I can’t wait to see Ava’s face as they grow. I’m still making my plans and choices of fruit and veg, but the theme will be the same – They should look fantastic and taste delicious. I will keep you updated but would love for you to share your own suggestions. You can share them in the comments below or jump over and like my Facebook page where we can engage with others on the plans you are making and the crops you are planning to grow on your allotments and kitchen gardens in 2017. Wishing you success for the season ahead. Next Why move to ‘no-dig’ allotment gardening? Aha! A fellow rhubarb fan! I extended my rhubarb opportunities last year by planting an autumn cropper called Livingstone. I haven’t picked any yet, so I can’t comment on the taste, but I am excited at the prospect of book-ending my summer with rhubarb crumble. I’m delighted that you’re getting your daughter involved in growing food. My kids used to love Japanese Wineberries. Do you grow them? Hi Sarah. Oh I am! It was very hard not be able to harvest any of the rhubarb last year. It looked fantastic. Very excited for some this spring. Now that’s interesting. I’ve also seen a variety that grows the entire season. Would love to hear how you get on with first harvest yours later in the year. Ava loves the allotment. I’m so pleased. She’s more than happy to spend the entire day there which is very handy. Now I’ve heard good things of wineberries before. Don’t have any but I’m definitely looking to expand the fruit we grow on the plot. Happy New Year to you too. Wishing you good health and growing success for the year. Great post! Thanks for sharing so much information, our plot (fingers crossed) hasn’t been too waterlogged this winter so far. We really ought to formulate a plan for ours, there’s so much we’d like to do. Thanks very much! Glad you enjoyed it. No its been pretty good in terms of rain so far. Resolving the waterlogging was hard work but it’s paid off. You might not even need to do everything I did. I’m hoping not, but we plan on using raised beds with a lot of compost dug in this year too as they were our best growing areas last year. Just learning how to cope with the water logging! It’s the paths mainly but we’ll persevere. We also love the allotment in the winter, peaceful you can get loads done. We always wonder why more plotters arn’t about, some close up in September and you don’t see them until next March! It’s a shame. Great post. It’s good that it’s just the paths. Have you thought about digging them out a foot or so? Fill them with Wood chips. It made a difference for me. You can also dig the paths out again after a couple of years and use the rotted chips to top up the beds. I think people are missing out on getting ahead and definitely the peacefulness of the allotment this time of year. Good luck. Sorry for the late reply! That’s exactly what were going to do. After this weekend they’ve just turned into a mud bath. Will this rain ever stop? Still we’ll be grateful for some in the Summer. Thanks for replying!